As the lone hold out in the muscle/pony car market, Ford needed to step up and face possible challenges to its successful retro inspired Mustang. Enter former Ford Racing icon Carroll Shelby and his redux of the Shelby GT500 version of the Mustang. 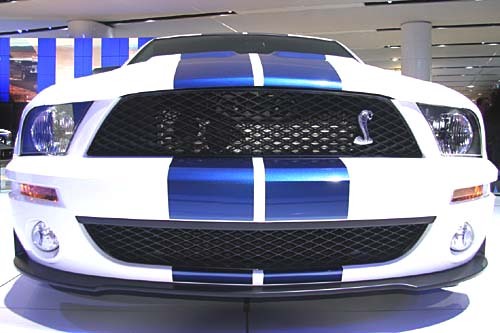 While the Challenger and Camaro models are supposedly just concepts at present, the Shelby GT500 is a production model. The GT500 also has automotive peerage allowing entrance to the current celebrity of nostalgic sheet metal. Power has been catapulted upwards with a 475 horsepower 5.4 litre V8 which also puts out a road thumping 475 lb/ft of torque. Power is transferred to the upgraded wheels and tires through a six-speed manual transmission. Rather than introduce an independent strut suspension, Ford has chosen to keep its less than avant garde solid, live rear axle. The suggestion here is that drag racing is the focus of the model rather than road course racing. Also setting it apart form any potential Camaro/Challenger assault is the option of having your horsepower enclosed in a two-door coupe or al fresco in an eye catching convertible. The Shelby GT500 is slated to hit showrooms this fall.